1 Begin by getting your pan nice and hot and then drizzle with a little bit of oil. Throw in the onions and chicken breast and cook them until light brown in color. 2 Flavour the meat by adding Knorr Sinigang Original Mix and pepper. Set this aside. 3 To assemble 1 serving: heat pita bread on both sides on top of a skillet to make it pliable. Next is to make a slit sideways to open into a pocket. Place 2-3 tablespoons of chicken mixture, tomatoes, cucumber, and cheese. You have the option to serve this with mayo. 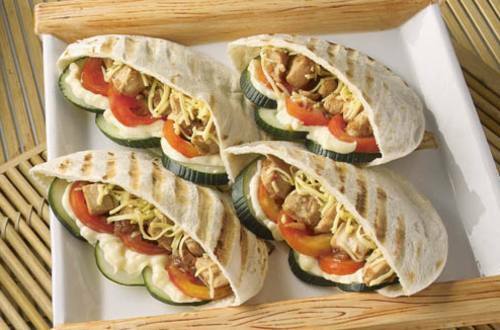 4 With a platter full of Pita Pockets, you are surely making memories with your family.